Red Ringspun Cotton Swim Towel measuring 125 x 75cm bath size. 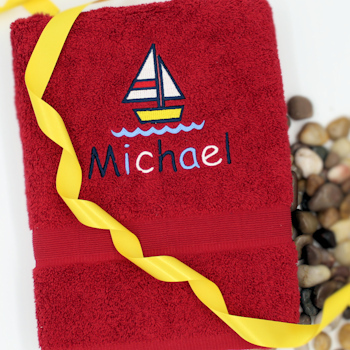 Embroidered with a colour coordinate boat and a name. A useful gift set that is made unique and personal with bespoke embroidery. Personalised gifts are custom made to order.